Mark pages within a document so that you can quickly flip back to them when you require. Extract marked pages into a new document. The pages can then easily printed or saved. 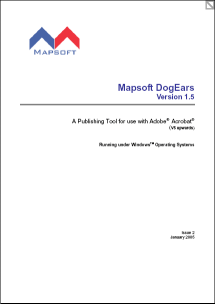 As well as using Dogears to help you locate specific pages within a document quickly and easily, you can also extract all the pages on which dog-ears have been set into a new PDF document. If you choose to do this then all the pages within a document that have been marked with a dogear will automatically be pulled into the new file: all pages that have not been marked with a dogear will not be pulled into the new file.